Lorraine have been touted by some as the 'saviours of pop' ; all the elements are there to turn these 3 guys from Bergen into superstars. A pioneering and forward thinking attitude and approach both aurally and visually combined with a healthy nod to their heroes of the past and traditional quality songwriting skills. And all this covered with a hearty dusting of pop magic. Their choruses are so big, and the live show is so great that if you shut your eyes these guys could easily be filling the stage at your largest local arena, and soon will, no doubt. There is a phrase in Norway: 'Janteloven'. Roughly translated, it means that you can't think you're bigger than you are. Don't get ideas above your station; know your place. It's a word that was once thrown at Lorraine, in their hometown of Bergen. "You sound like a stadium act," one person said, as if that was a bad thing, but to any sane human being Lorraine's stadium-filling sound is more like that of a band defining their own destiny. Lorraine are Ole Gunnar Gundersen (vocals), Anders Winsents (guitar) and Paal Myran Haaland (keyboards, programming). Between them the members' personal influences range from New Order, Kraftwerk and Depeche Mode to Kasabian, The Smiths and The Stone Roses, so it's no surprise that Lorraine's own music sounds like it should come with 'Your new favourite band' stamped across every CD. Melodically breathtaking with a lyrical touch that recalls the flamboyant nervousness of Neil Tennant at his most miserably optimistic, Lorraine's songs are finished off with a unique modern twist. The band have their own take on the Lorraine sound - they named themselves after Marty's mum in Back To The Future, but their ideology lies in the film's sequel. After a brief period knocking about with friends in a Prodigy-influenced electro metal outfit Anders and Ole set their sights elsewhere and, on their way back from a jam session in a local pizza parlour, chanced upon Paal. He was at a bus stop, drunk and shouting. It was not long before he became Lorraine's third member, his (oddly immaculate) bedroom doubling as the band's first recording studio. In the summer of 2000 the band, now in their late teens, decided not to go back to school. Paal's bedroom was traded for a workspace, 45 minutes outside Bergen, in a decaying factory building. The units surrounding Lorraine's studio were filled with either crackheads or car mechanics. The heating didn't work. It's cold anyway in Norway, but in this ice-pocket it was often so cold that floppy discs would freeze into the band's sampler. The band stayed there for twelve months - it was like self-imposed boot camp. The trio would record a rock song one day, a pop song the next day, and maybe a techno track the day after that. Some days they would start with a lyric, others with a bassline, or a keyboard riff. No two songs would fall together in the same way. Then, one day, everything clicked. Their first releases was two 7" singles "Twenty Years Under Water" and "Lovesongs For An Ugly Girl" with remix of Twenty Years Under Water made by Paal as b-side . The song "Twenty Years Under Water" was put on a compilation "This is Norway". After this, in 2003 band released their first CD - Lorraine EP featuring new song "Echoes", a great ballad. This was the first Lorraine's steps. In the same year, 2003 they were able to release debut album. They reworked songs "Twenty Yeras Under Water" & "Sold Out" for album, so their sound "grown up" and became more professional. Lorraine have been described as an electronic rock'n roll band. Their music is filled with plenty of references to the modern rock and electronica scene. In Norway the press have been throwing superlatives at Lorraine's first album. The Perfect Cure is produced by Bjarte Ludvigsen and is mixed by Nille Perned (The Wannadies, Bob Hund and Kent). The sound of The Perfect Cure is both delicate and sophisticated, raw and primitive.This album was inspiried by such bands as Placebo, The Cure, The Smiths, Joy Division, Prodigy and others. Lorraine have already done lot of concerts in Europe, In 2003 they have done approximately 100 concerts in countries like France, United Kingdom, Holland, Germany and Norway. Lorraine has reputation as a very good live band but they also find time for making new songs. 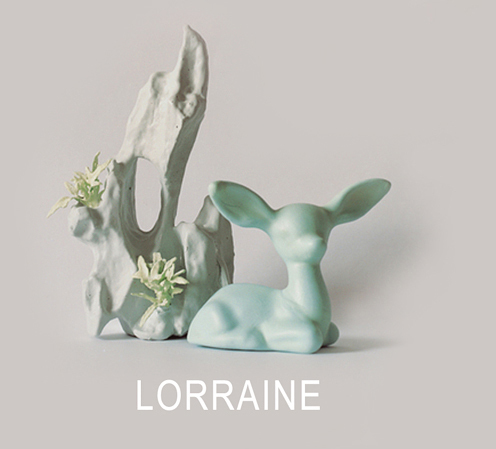 The newly invigorated Lorraine sound was splashed in broad strokes across the songs 'Saved' and 'I Feel It'. Between them they formed 2005's teaser single - a limited, clear vinyl double a-side 7" on the indie label Genepool - which prompted a flurry of interest from labels and the media. It was, Time Out rather breathlessly declared, "the greatest debut single of 2005". There is plenty more to come. So they said "goodbye" to Rec90, label where all their music was released. Then, one day, everything clicked. "Our songs mix up reality and unreality," Paal explains. Many of Lorraine's songs are based on dreams; Ole believes that only in dreams are we completely honest and unfettered by often unfairly imposed moral and societal codes. "It's about articulating the thoughts in your head," Ole adds. "Thoughts which wouldn't come out in conversation - hopes, dreams, a dark positivism. I don't know if our songs are happy or sad - we can be quite melancholic." He thinks for a little while. "There is happiness, but it might only be temporary." Band released a lot of new singles - they were preparing to release new album "Pop Noir". The band continued to touring and write new material for album. "We've had some kind of trip into another world making this album," Paal smiles. "We're all about big atmosphere, big sounds, big songs. We always wanted everything to be very big." It's hard to believe these particular dreams won't become a reality. It is, after all, about defining your own destiny. But suddenly, in late 2008 they deleted official site (lorrainemusic.com) and myspace page (myspace.com/lorrainemusic). Nobody knew what happened to the group and why their official sources is lost. But then in Wiki we found message that band changed their name to "Black Room" featuring link to the new myspace page. In March 2009 Black Room without any press-releases once again released 7" single "I Feel It" and new album "Pop Noir" in Japan. After the house they rehearsed in burnt down (late 2008), leaving little behind except songs for an album the name 'Black Room' became very suitable. The musical landscape they operate in sounds like the album title depicts, pop music with a darker feel to it. The artwork is based upon the film genre 'film noir'. Instead of visualizing the dramatic and theatre-like lighting in these films, the moon as the light source is the main object throughout the artwork. The moon represents the long and dark winter months in Norway, the country Black Room hails from. Guys went to the Japan with the conserts, but when they come back their name changed again. Now they calling "Blackroom". Band streaming on myspace two new songs "Gasoline" and "Falling Down", so it seems we should expect a new album...or the name change!